Langar literally translates into “free kitchen” and in the Sikh world it relates to the Guru’s Kitchen. The story of langar starts with Guru Nanak Dev Jee who was the founder of the Sikh faith. One day Guru Nanak Dev Jee was given 20 rupees by His father and asked to go out for the day and return with a profit. His father had grown weary of His son’s disinterest in worldly affairs and hoped the challenge would spark an interest in business. Guru Jee wandered through the local area and came upon a group of Hindu saints. The saints preached from city to city and lived hand to mouth. They had torn clothes and no food. Guru Nanak Dev Jee believed no action could be more profitable than serving those in need so He bought food and clothes with His father’s money and personally served the saints. Upon returning home Guru Nanak Dev’s Jee’s father was not pleased with His actions but Guru Nanak Dev Jee explained that sharing our earnings with those less fortunate is the most fruitful and profitable action because it serves the light of the one God that resides in each Human Being. The main principles of Langar are: fighting hunger, equality in action and teaching compassion. The institution of Langar was nurtured by the Gurus to serve those most needy in society. It became a symbol of the type of society the Gurus sought to establish. The Gurus believed in an egalitarian society and a society in which everyone has access to food, shelter, education and basic human rights. Langar is always run free of charge by volunteers and is served to all people without distinction of gender, socio­economic status, caste, ethnicity or religious creed. Is is sustained through donations alone. Langar was a revolutionary concept because it broke down many barriers between a divided and hierarchical society in which people rarely mixed on a cultural level. Every Sikh place of worship ­ Gurdwara ­ includes a Langar serving food 24 hours a day to anyone in the local community. Langar then and now provides a powerful vehicle for Sikhs to serve their local community for the common good by sharing their money, time and effort whilst promoting the ideals of equality and social justice for all. Many Sikh charities serve Langar for homeless people such as Midlands Langar Seva Society (MLSS) Sikh Welfare and Awareness Team (SWAT) and Langar Aid who regularly organise Langar for people affected by humanitarian crises such as those in Iraq and Syria. Each year, in October #LangarWeek takes place worldwide to raise awareness of the concept started by Guru Nanak Dev Jee. The first Langar event organised by a Sikh society took place at the University of Birmingham in 2004. It was an overwhelming success and won the best student event of the year. Since then many Universities have taken on the idea with over 15 educational institutions around the UK hosting Langar events in 2014­2015. We estimate that in the last academic year over 6,000 people partook in the tradition of Langar at UK­wide universities. help universities reach out to ethnic minorities on campus. Anyone is welcome and encouraged to help serve the food but Sikh students in particular enjoy the opportunity to serve their fellow students and staff members at Langar events. 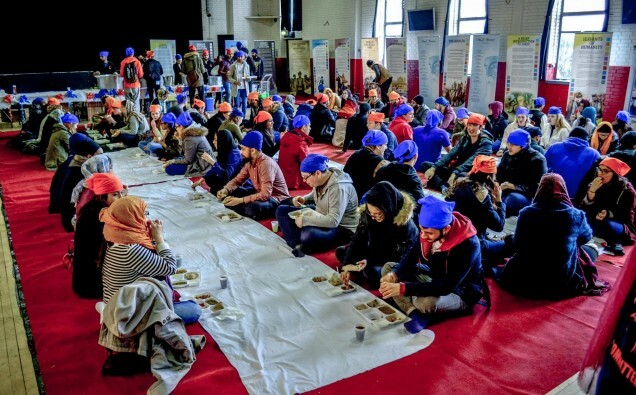 Universities which have hosted Langar events often offer further support and engagement with the Sikh societies running them because the philosophy behind Langar is something that universities share and wish to promote. The National Union of Students (NUS) also recognises the importance of Langar events to cohesion on campus and promoting good interfaith relationships. Below is some of the audio tracks you may have heard whilst at a university Langar on Campus event. These are quite meditative and soothing and a great way to relax and unwind. We are lucky enough to offer these tracks as free to download for personal use so please do enjoy! Have you organised a Langar On Campus event? We'd love to hear from you! We would love to hear how we can make our Langar On Campus events better. A really important way to do this is by you sharing your planning and feedback from the event through our BOSS 'Bright Ideas' project. Have you attended a Langar On Campus event? We'd love to hear from you!